During my drive to the shop this past Monday morning, I actually had the heat on. The season is, once again, changing. The parched landscape will soon be rehydrated and revitalized. Golden hues will be replaced by rich jewel tones. 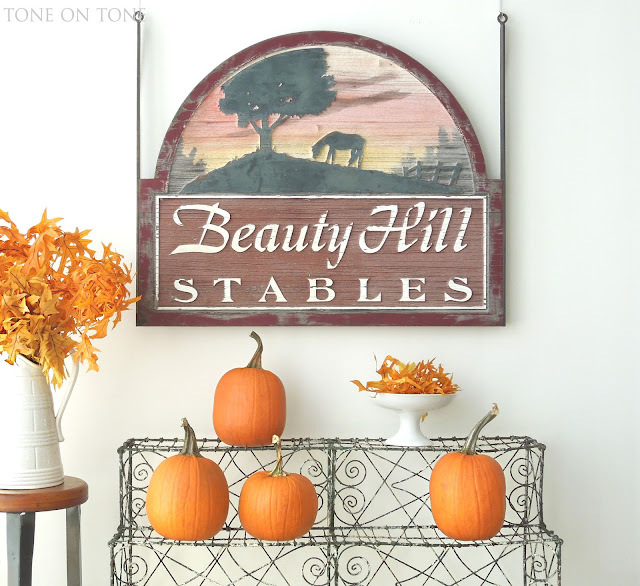 And it will be time to focus on fall decor. What do you do to welcome fall? The entry is always an easy place to incorporate seasonal accents. You can change out the foyer rug / doormat, add a festive arrangement, hang a wreath, etc. None of those requires major effort or expense. Keep in mind, also, that those are seasonal, so have fun! At our home, I'm keeping it natural and neutral. Guests are greeted by a wheat wreath in a subtle honey color. I gathered a few branches and twigs from the garden (and the mall :) for a woodsy arrangement in a glass hurricane. For softness, stems of dried hydrangeas, especially Limelights with their autumnal rosy shades, would look pretty mixed with branches. Our foyer is rather small with a low but charming barrel ceiling. The furnishings are simple and airy. Despite the room's petite status, it's appointed graciously with a large mirror to reflect light, a narrow console for guests' belongings, and stools should someone need to remove muddy boots. As soon as the weather cools off even more, white Lumina pumpkins will go out on the loggia. Come October, my collection of brown-and-white transferware will be back in action for fall entertaining. See them here. By the way, I am thinning my collection, and will be taking some of the transferware to the shop. Speaking of the shop, the tone-on-tone fall theme continues there. For this Belgian bleached dining table in front of a wall of ironstone china, I created a centerpiece using Lumina and Baby Boo white pumpkins, naturally-shed antlers, dried hydrangeas, and votive candles - all in shades of pale! With a monochromatic palette, there has to be texture to keep it from going flat. Notice the contrast of the creamy pumpkins against the driftwood-like patina of the oakwood. And how delicate the crepe-like hydrangeas look next to the antlers. 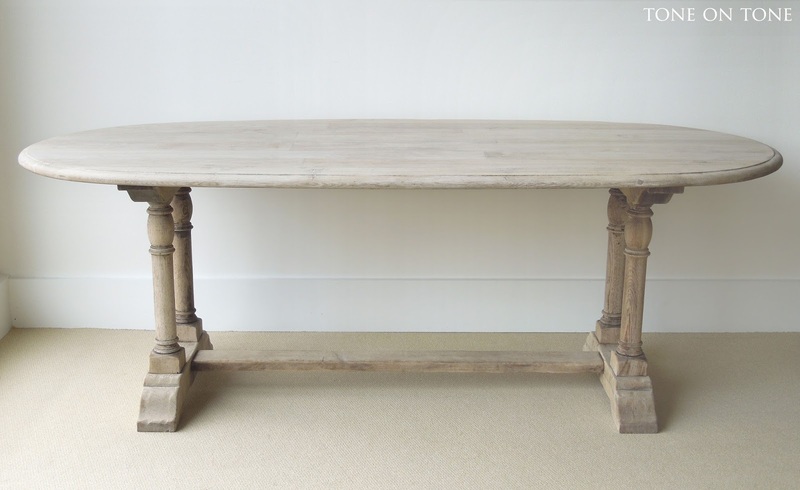 Here are more photos of the 19th-century Belgian table. I'd love to see it in a kitchen for casual dining. Or perhaps as a desk in a study. Now for something shocking: O R A N G E! This antique American stables sign was calling for something vibrant. Cheerful pumpkins were perfect. Hand carved and painted on both sides in autumnal hues, this is just top quality signage. Over a mantel, it would add authentic farmhouse charm! Here I've grouped the sign with a mix of antique and vintage items: English Victorian wirework plantstand, French watering can, ironstone china and factory stool. The oak branches with leaves are real! They've been preserved / sprayed. That centerpiece is beautiful! I'm so happy to welcome fall. I'm painting my front door, planting mums, and buying stuff for the holidays like mad. Hello Loi, It's funny, but while we have a very slight spring in Taiwan, there is nothing that corresponds to fall. I usually visit Ohio in the summer, but just once I wish I could return in autumn. By the way, that is one wild plant rack! Looking good....love the table vignette with white pumpkins, stunning! You are well ahead of me, my home still has signs of summer. i can't bear to take out my blooming inpatients from their planters even though I am dying to add white mums! LOVE that Belgian table...wow! Happy fall Loi. oh your table! it's stunning! i adore it, loi! can you just come over and style my house. today because i need to shoot it tomorrow. ok thanks. ;) seriously love it- your talent always blows me away. Lovely, Lovely,Lovely as always, you even made orange look good and you know I am not an orange gal at all. I would imagine that your home exudes warmth and hospitality, I can almost feel it through the images. Happy First day of Fall! you are KILLING ME softly softly oh so tenderly with these visions of tonal gorgeousness. the entry is so inviting and comforting. 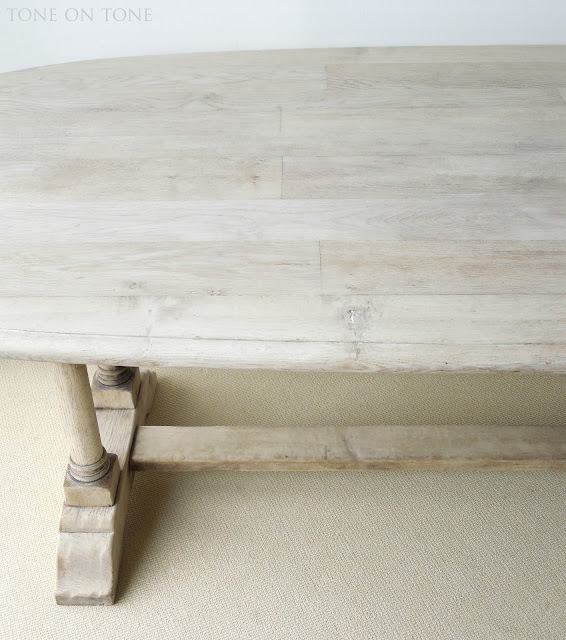 and the bleached belgian table is beyond exquisite with its perfect patina and proportions and informal elegance. i am so grateful for your site, loi. for your sensibilities and graciousness in sharing the beauty in your world. so much thoughtfulness and connection to nature and its bounty. you have succeeded at helping this hopelessly summer lovin blonde ease into the season's change. peace and love, baby boo. So pretty, Loi! Orange is my favorite color. I love all the fall colors. Don't love to see the cooler temps though. The older I get, the more I like the warm summer weather (but not the humidity). I'll probably end up retiring to Florida in 20 years. Happy autumn to you, Loi. I am at work on my very short lunch break with you. Your world provides peace, kindness and a beauty many of us seek in our surroundings. Like you I have she'd antlers and for me I prefer the natural and neutral tones of earth herself. Gorgeous and uplifting as always dearest loi and tom! Your Entry is Perfect and the mirror is the Best!! Someday it is MC's and my dream to visit your shop and meet you. What a day that would be for us! loi, you are speaking to my heart, I just did such a bleached washed in whites and creves filled with grey tones to a dated old armoire that now pushes the envelope of a perfect blend from Nordic to French... I am in love with smaller entry ways with larger then life scaled pieces, and you know oh so well the best in designs is to do just that as long as it is simpilfied as you have done perfectly to your entry onto your beautiful open veranda, and garden pathway. I like you love the naturals. It frees ip space in a home for ones thoughts to be the main focus, it relaxes the mind creating a home sanctuary. I love your style and always look for a bit of inspiration from you..... With all the books coming out from bloggers, and hobby designers, I would love to see you with a book in the mix, it would be on everyone's coffee table. That entryway mirror I am in love with, the Belgian planked table perfectly placed with a center piece that speaks volumes to entering Autumn. I never tire with my visits to you, and often return just for another quick look. Seasonal changes that inspire you and yours. Wish that table was in my house and my oh my that sign is fabulous! We're swooning over your white and white table setting - what a lovely way to celebrate the season in a subtle and elegant fashion! Your fall tips, ideas, and inspiration are wonderful! 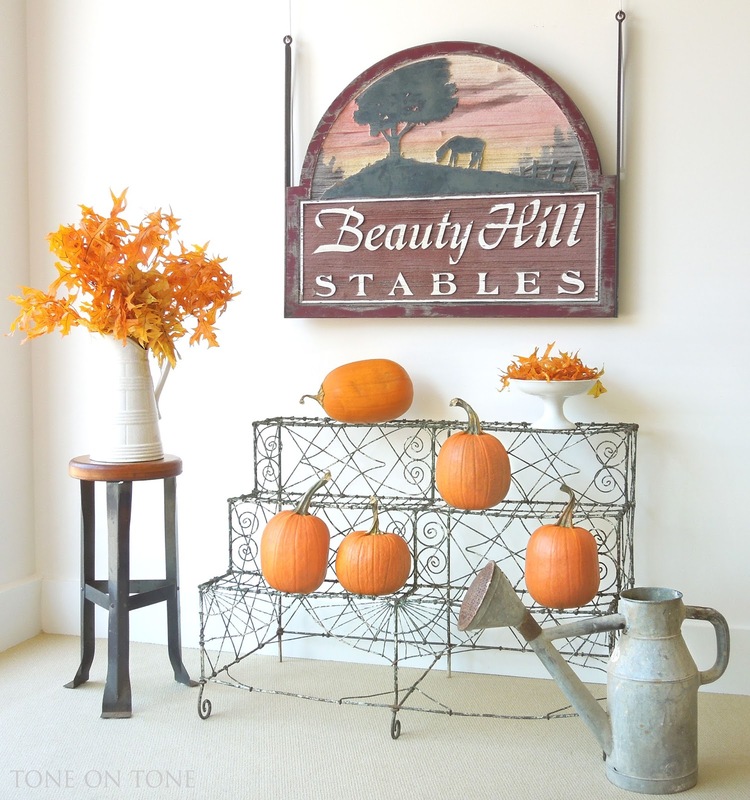 I love your neutral fall decor created with so much interesting texture. Loi, your home and shop are to. die. for.!!!!! I love the table arrangement, do the white Hydrangea dry white? They look amazing with the white pumpkins and antlers. I just love this time of year, don't you? So lovely Loi, I prefer lighter Autumn accents like the white pumpkins in general; however a bit of gold and orange works as well! Anything you design seems to speak to my hearts though so thank you for all of the inspiration!! No need for the car heater here unfortunately. We are still cranking up the AC, but there is a touch of fall in the air. I'll be eager to see what brown transfer ware you edit out and into the shop. I like to add a piece or two when I can. My collection is modest, but I enjoy bringing it out for the autumn months. So lovely and stylish Loi. Your neutral and honey colour theme is perfect for Fall. It is still hot over here. Can't complain though. So so pretty...I love your entry and the white pumpkins are my favorite! A refreshing tone in the display of monochromatic minis and their co stars! Their traditional, coral counterparts are just as lovely in their own vignette. Both creatively seasonal! Happy first day of fall, my friend! I have got to get started on my fall decorating. Your table centerpiece is stunning. 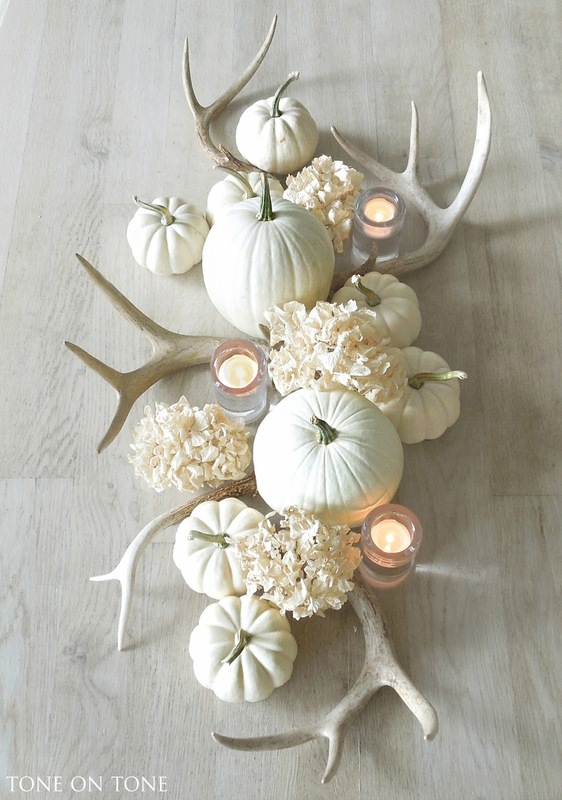 Love the combination of the white pumpkins (my favorite), and the antlers…perfection! 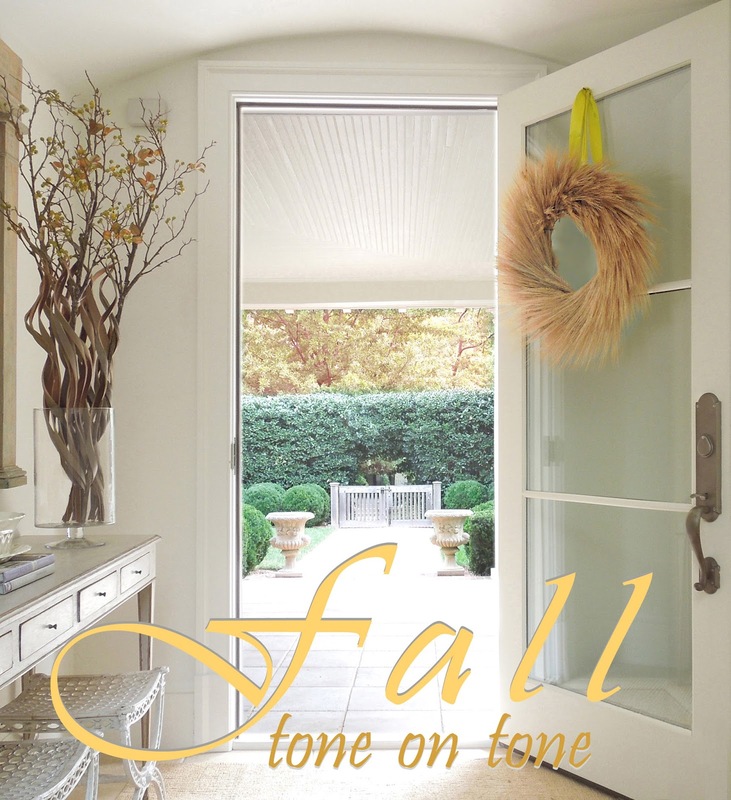 Happy Fall Loi your foyer is breathtakingly stunning from the barrel ceiling down to the sisal rug on the tile floor. I love the large mirror. Your store welcomes and your display skills are outstanding. 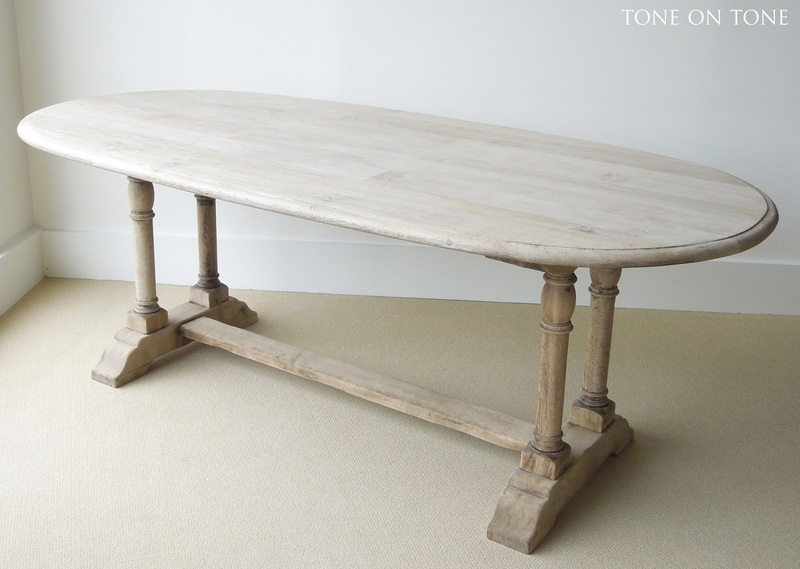 I hope the Belgium table will find the perfect owners for it, softness and grace in an approachable piece. Enjoyed all your tips, pretty post. It's time to place the Pumpkins outside the air is feeling very autumn like. Your entry is absolutely my favorite for fall. In fact, I have been slightly obsessed with re-creating your wheat sheaf wreath since you posted it on Instagram a few weeks ago! Love, love, love!!! Your home looks beautiful Loi. Love your neutral decorations. Time for a return visit to Tone on Tone. I've missed your gorgeous vignettes and delightful conversations. I love the centerpiece you created. White pumpkins are so beautiful. I've been starting to do a little fall decorating around the house. You've given me inspiration to finish things up. Lovely Fall Tour! Oh my everything is gorgeous! Your table decor and the room is dreamy! Wow, you created a beautiful Autumn Home! Love the table setting with the antlers and white pumpkins...perfection. Loi, hello and a happy Fall to you! Your shop looks magical! I love the tables cape with the white pumpkins and antlers! I am going to have to borrow that idea! I may even add a few bleached pine cones as well. I hope that you are having a great week! You feel your entry way foyer is small? :-) It's roomy compared to my condo. I adore your softer, neutral colors and try to inject that feeling where I can. But each time I attempt to copy this style, out comes the baby blue, whisper mint green and pink touches. I just cannot free myself from color totally. I guess those shades are my neutrals. That said, my Autumn arrangement is already in place on my foyer garden table. It's newly adorned with a large, ceramic, cream-colored pumpkin with a rusty stem and leaves (from Pier 1 Imports). It's covered with leaf-like cutouts and will showcase a tea light later in the season. My front door proudly wears the multi-colored, dried corn I hung last weekend. I like to take the corn husks and peel them apart into hundreds of strands, sort of like messy blonde hair. It makes the arrangement full and interesting. The corn is tied with an old, off-white, somewhat wrinkled ribbon that was chosen from the many that I save. I love that it does not look too new and adds the right amount of shabbyness. The antlers and pumpkins are simply divine. They go so perfectly together. Love the combination of the white antlers and pumpkins. You always make less look like so much more!! Whatever you do I'm sure it's done to perfection I especially like the centerpiece. BTW, Linsey and I had a nice visit sharing our experiences with you. Visiting from amother blog that featured your room. I love the oval table as most commentators here did too. I love the softness and comfort it sets in a room. I posted to my Pinterest board with your blog name. I will a new follower here now. There is such a sense of serenity and beauty every time you showcase a room or a vignette in your home. How wonderful it is to enter your home and immediately feel engulfed in beauty. 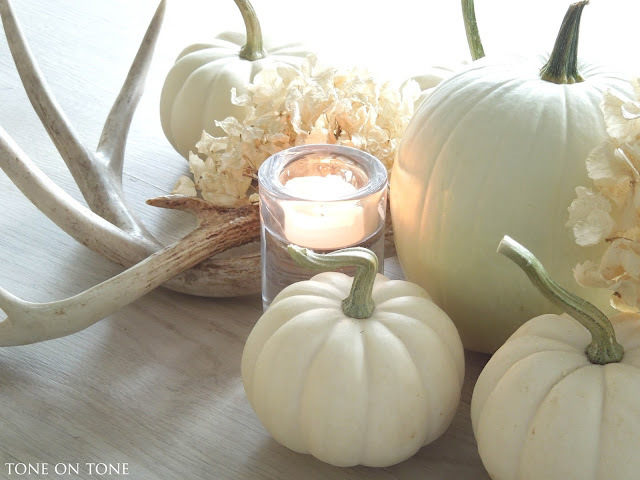 Love the vignette of the pumpkins and antlers....you are the master of tone and texture! I love that table Loi! What are the measurements? I'm looking for one for my Dining room, need to replace my old Value City table already!!! I also love how you simply styled your entry and that centerpiece is just stunning!!!!! It should be in a magazine again! Your tone on tone decor is never flat! 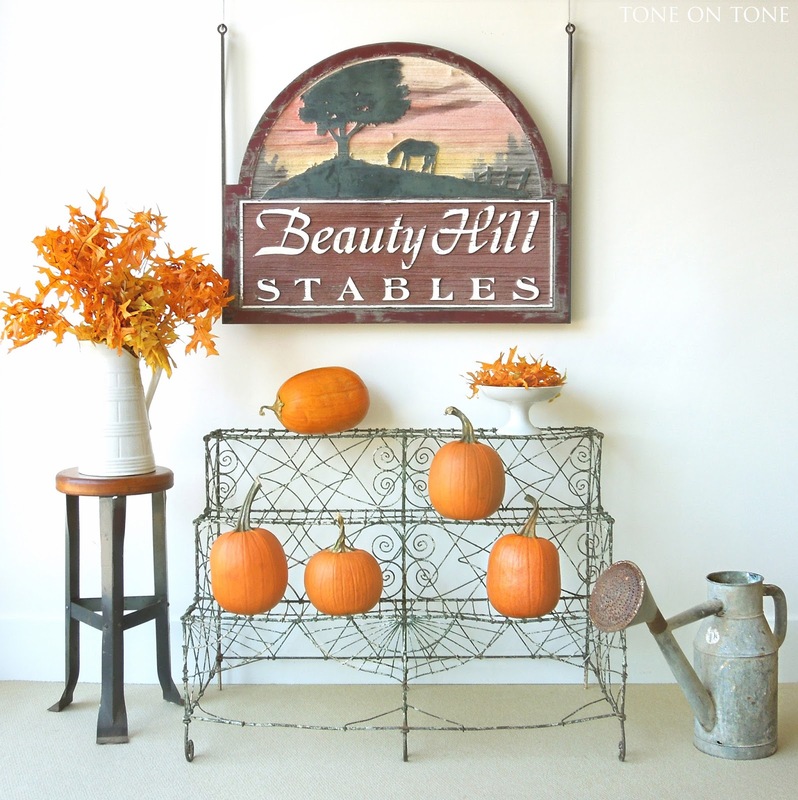 There are so many things I like in this post,but I'll settle for the wire plant stand and yes the antlers to go with all my white pumpkins. it's great and i love this ! Loi, this is one of my most fav posts from you. I have to get my hands on some shed antlers and get ready for Autumn! Always such a beautiful home with classy decor. I absolutely love the centerpiece. Where did you find the antlers? Simple but oh so elegant!!! Love it!!! I would also love to know where you purchased the antlers. I am in LOVE with that antler decor! looking forward for more contents. The blog was absolutely fantastic! Lot of great information which can be helpful in some or the other way. Keep updating the blog, looking forward for more contents. Table decorations, - Get the best deal on party jar, bar jar, mason jar solar lights, solar mason jar lights, tabletop decorations, solar jars, solar jar lights, table decorations, garden jars & gift jars at amazon.com from great selection at Sogrand Industry Inc Store.